The statement may come as a setback to Congress leader Digvijay Singh who had cited a report of the private forensic lab in the apex court to say that the hard disc was tampered with. NEW DELHI: A private forensic lab expert has told the CBI that she had never given any report stating that files contained on a hard disc which allegedly carried details of pay-offs in the Vyapam scam case were tampered with, an agency official said here today. 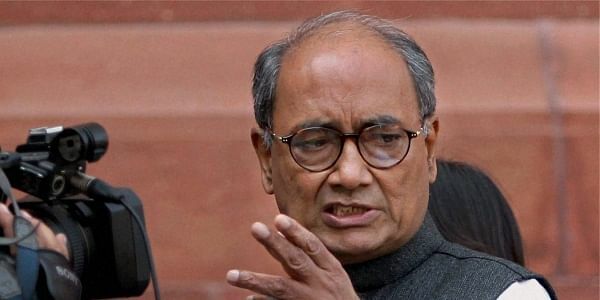 The statement, which is part of a CBI charge sheet filed in a special court in Bhopal yesterday, may come as a setback to Congress leader Digvijay Singh who had cited a report of the private forensic lab, Truth Labs, in the Supreme Court to say that the hard disc was tampered with. Citing the report, Singh had told the apex court that deleted file relating to an excel sheet with names of candidates, roll number, sponsor, "sponsor/recommender", and name of examination was initially opened at 4.20 pm of July 18, 2013, he said. "...at that time 'CM' featured in the excel sheet at 48 places out of 131 as recommender/sponsor. However, the tampering took place at 8 pm within a few hours on July 18, 2013, when the 'CM' featured at 48 places was either replaced with 'UmaBhartiji', 'Raj Bhavan', 'M/s' and 'minister' or deleted together," the official told quoting the submission made by Singh. He said the CBI had questioned Neeru, Assistant Director at Truth Labs, who had analysed the pen drives sent by whistleblower Prashant Pandey carrying the "tampered" and "untampered" excel files. She had told the agency in her report she neither identified nor indicated any tampering, he said. She had also refused that the excerpts cited by Singh were not part of her report. The expert said she had mentioned in her report that no forensic opinion can be given without examining the hard disc on which the files were stored, the official claimed. Neeru told the CBI that no hard disc was examined by Truth Labs and the examination was confined to three folders in the pen drive provided by Pandey's lawyers, he said. In such circumstances, Truth Labs will not opine anything about tampering, she had told the CBI, the official said. The CBI also said that the Central Forensic Science Laboratory experts had found that the files in question were last altered in April, 2012, and since then no changes were made in them. The official claimed that the experts had found that hash value of these files did not change after April 2012. "Whenever an excel file is changed, even slightly, its hash value changes. These changes can be tracked from computer log. The experts identify the changes to ascertain if changes have been made in an excel file or not," he said. The agency in its charge sheet filed before a special CBI court yesterday has said the forensic analysis of the hard disc drives seized from Nitin Mohindra, an official at the Madhya Pradesh Professional Examination Board or VYAPAM, by the state police has shown that no files having letters 'CM' were ever stored in them. The CBI rejected allegations of tampering with the hard disc, which was being considered as a crucial piece of evidence in the multi-crore recruitment scam alleged by Digvijay Singh and whistleblower Prashant Pandey. It said Pandey had also submitted two pen drives to the Delhi High Court and the CBI, carrying excel sheets to buttress his claim that hard disc drives seized by Indore Police in 2013 were tampered to remove 48 instances of the letters "CM" or the chief minister from the records.